In this edition of the parkrun newsletter we explore the meaning of parkrun and show the diversity of the first runners home. adidas visits parkruns around the country with their adivan to showcase their product line. The new Uvongo parkrun is off to a great start in KwaZulu Natal as is the first Cape Town parkrun in Bloubergstrand named Big Bay parkrun. We at parkrun deliberately avoid referring to our Saturday morning runs as races. We prefer to allow every parkrunner to run or walk at the pace they feel most comfortable with and to enjoy their own parkrun experience. So recently I have been nursing a bad knee injury but in the true spirit of parkrun I have found a great deal of enjoyment at parkrun by just jogging along slowly or indeed even walking. 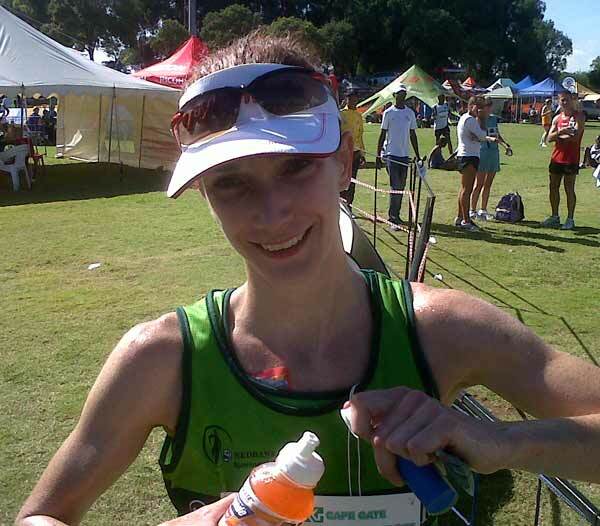 Thanks Valerie Maclean for your great company at the back of the field at Roodepoort two weeks ago. It was a wonderful autumn parkrun experience walking along, chatting and being lapped by the huffing and puffing frontrunners. That said, it has been really interesting to take note of some amazing runs in recent parkrun results. Understanding that everyone who completes a parkrun is a winner, in recent weeks the first to finish have incluced a runner in the 60-65 age category, oldest finisher, a female runner and a junior! Congratulations “JP” Deris for charging home in 25:20 on the extremely testing Nahoon Point course. 25:20 is a quick time for anyone but for a runner in the 60-65 category that is an extra special run. We expect great things from Ann Boniwell in the Comrades marathon in a week’s time and she underlined her state of readiness by trouncing the whole field at Roodepoort parkrun last Saturday. Not to be undone our juniors have consistently surprised us at various parkruns around South Africa. 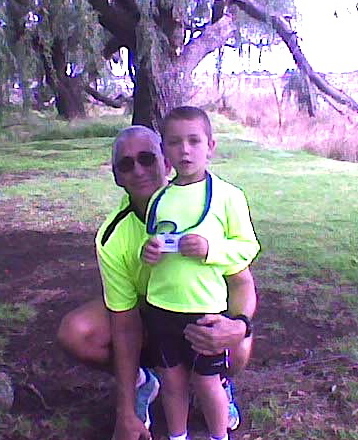 14 year old Kaid Morsink has two great performances at Uvongo parkrun. 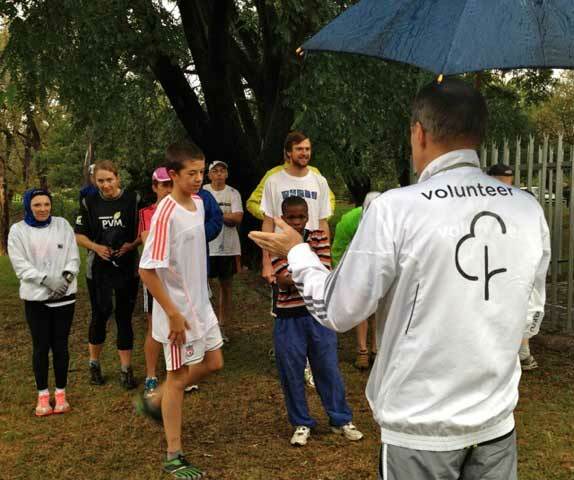 Uvongo parkrun was launched a couple of weeks ago in lashing rain. This still didn’t deter some hearty South Coast parkrunners from braving the elements and helping to launch this very scenic parkrun. Well done to Jason and Nicci Morsink and their enthusiastic team of volunteers and thanks to Deputy Mayor Johnny de Wet for his kind words of encouragement. Speaking of scenic! The week before the launch of the Uvongo parkrun Graeme and Bev Powell launched the Big Bay parkrun at Bloubergstrand in Cape Town. 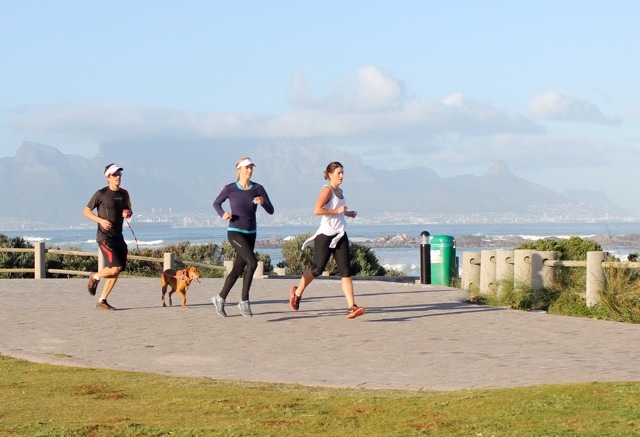 Cape Town has been crying out for a parkrun and at last it has happened. To add some athletic talent to the occasion, Elana Meyer (Olympic silver medallist) and Ryan Sandes (World Class trail runner) made an appearance and took part in the run. Ryan ran with his dog on a lead. Elana will shortly be joining the parkrun event director family tomorrow as we launch the new Route 44 parkrun in Stellenbosch. Read more about this fantastic parkrun in future newsletters. Next weekend sees the running of the Comrades ultra-marathon between Durban and Pietermartizburg. Best of luck to those parkrunners taking part in this auspicious event! parkrun will have a stand at the Comrades expo at the International Convention Centre in Durban from Thursday, 30 May to Saturday, 1 June. Please pop in to say hello and encourage all of your running friends to register at the stand. The Modderfontein Reserve parkrun course record was shattered once again this last weekend, not for the first time, nor the second, but for the third time by a parkrunner debuting at Modderfontein Reserve parkrun. 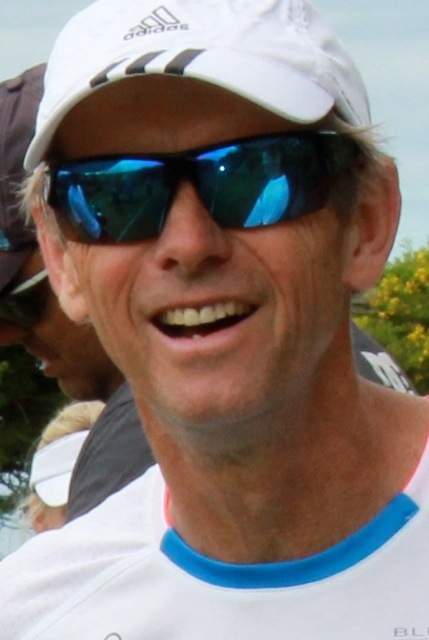 At the Inaugural event the course record was founded by non-other than the “Fordyce Assassin” Anrich Zimmerman, who cruised through the field, pipping country manager Bruce Fordyce by a mere fifteen seconds. Then came along Gustav Roos who after a 25 kilometre training run, to the start of event # 10, trotted out nineteen minutes and twenty seconds making history by being the first to break the twenty-minute mark at the Reserve. Six weeks later, Quintin van Zyl breezed through the field and reset the record to nineteen minutes and two seconds. Event # 19 saw Modderfontein Reserve’s first sub nineteen minute as Glyn Allen scorched through the field to drop thirty-six seconds from the previous record, finishing in eighteen minute and twenty-six seconds. 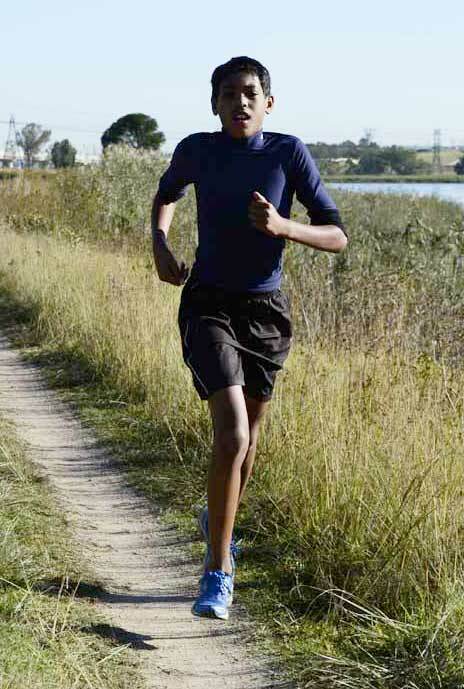 In the Juniors, Kyle Arendse reached the prestigious milestone of achieving Ten parkruns, all of these at Modderfontein Reserve parkrun. Congratulations, Kyle! We were delighted to welcome the adidas team along with their adivan at Roodepoort parkrun last Saturday. adidas offered a range of shoes that runners were able try out on their run, as well as free foot scans. parkrunners were encouraged to sign up to the adidas three stripes programme to enjoy special offers and notification of new products. A lucky winner was drawn from those who signed up on the day. Well done to Lauren Tippet for winning and being awarded with a pair of adidas shoes! Congratulations to junior parkrunner Ethan Gray for completing 10 parkruns! Not only has Ethan regularly taken part in a parkrun event, he and his brother Tristan have become regular volunteers at our events. Many thanks to them both! It is unfortunate that on a few of our parkrun Saturdays we have been met with a litter-filled park. A huge thank you to Morne Van Jaarsveld and his father Neil, for noticing the mess left by others and for organising a litter cleanup of their own! You are absolute stars! We hope to organise a collective effort in future. How has parkrun changed your running: I have replaced an occassional weekly timetrial with a parkrun event. It adds an “off-road” dynamic to my training and gives me a reason to get out of bed early on a Saturday morning. What do you like about parkrun: I enjoy sharing an event with people of different ages and levels of speed and fitness. Parkrun isn’t about who is out in front setting the course record… its about the young families participating in an event together, runners (and walkers) keen to exercise their furry friends and a community gathering together to share a fun-filled hour or half hour of good clean entertainment (weather permitting). All children under 11 must be accompanied by a parent or guardian. Guardians must ensure that children place themselves appropriately so as to prevent a situation where they are being repeatedly overtaken at the start. This is to ensure the safety of your child. The parkrun show is the audible roundup of the "goings on" of everything that caught the teams eye from the weekend in parkrunworld. Brought to you by Marathon Talk. In this edition of the newsletter, Roodepoort parkrun celebrates its first birthday. The scales tip as SA reaches its ten thousandth member! We take a look at the historic significance of Modderfontein Reserve and a Sunrise-on-Sea parkrun member organises a clean-up of their route. Congratulations to Roodepoort parkrun on celebrating its first birthday on Saturday! Well done to event director David Ashworth and his team, comprising Ann Boniwell, Sonja Ashworth and Trevor Ashworth. Who would have thought a year ago when a small band of 12 runners ran the first Roodepoort parkrun that a year later a group of 77 would be running Roodepoort parkrun consistently. As always thank you to adidas and Blue Label Telecoms for their support on the day. Another Big Thank You to Florida Running Club for supplying the champagne, birthday cake and other refreshments. There were far fewer than 77 parkrunners the previous Saturday when countrywide lashing rain reduced parkrunners to a handful all over the country. In fact, at Modderfontein Reserve parkrun there were more volunteers (4) than there were runners (3). However the message is clear - unless there are dangerous weather conditions - SA parkruns will always go ahead. Such is the enthusiasm for parkruns in South Africa there are always some hardy souls willing to brave the elements. In May there will be some exciting growth with the launch of three new parkruns. 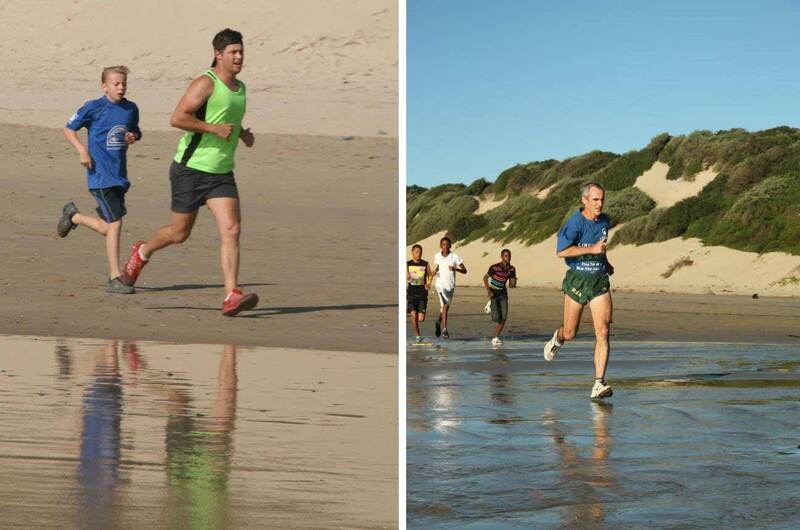 Graeme Powell’s ‘Big Bay parkrun’ in Blouberg Strand will be our first Cape Town parkrun. The following week, Jason Morsink will launch ‘Uvongo parkrun’ and Elana Meyer will launch ‘Root 44’ on 25th May in Stellenbosch. parkrun SA has registered its 10 thousandth member this month and worldwide parkrun numbers went over ½ a million. Following on from our new-born Springbuck in February at Ebotse Estate, we have another junior “Springbok” in the making. Dirk Jansen Jnr. is only five and a half years old and by the time you finished reading this article he would have completed his 10th parkrun at Ebotse. Barely tall enough to reach the elbows of the others. I was astounded that he could run like that. To prevent burnout, his coach, grandparent Dirk Janson Senior, only allows him to run every second week. It would be interesting to find out from other parkruns around the world if there is perhaps a younger runner than Dirk. Well done to Dirk Jnr. and Snr! Torrential rains hit Ebotse on the 20 April and storms affected many other parkruns in South Africa. Well done to the “Four Musketeers” who took up the challenge to face the adverse conditions and still run. Well done Martin Codier, Peter Hawthorne, Iain Morshead and our only lady for the day, Dawn Vollmer. The Modderfontein Nature Reserve is the second largest private reserve in Gauteng, covering an area of 275 hectares to include a portion of the Modderfontein Spruit. There are 4 dams (Fish Eagle Dam, John Voelker Dam, Grebe dam and Blue Crane Dam), with a variety of habitats ranging from grasslands, forests, riverine vegetation to wetlands. At the heart of the Reserve is a small complex of heritage buildings fondly called "Isidleke" which means "the nest". Isidleke comprises of 4 buildings, namely; Dobb’s House, a barn, the shooting tower and an office complex. The old barn was built in 1896 for Sir Alfred Beit, who was once the owner of a hunting lodge in the area. The only part of the hunting lodge remaining today is the shooting tower. The dam keeper’s house - Dobb’s House, was originally constructed in 1934. In 1991, the office block was built together with ablution facilities catering for up to 100 visitors. 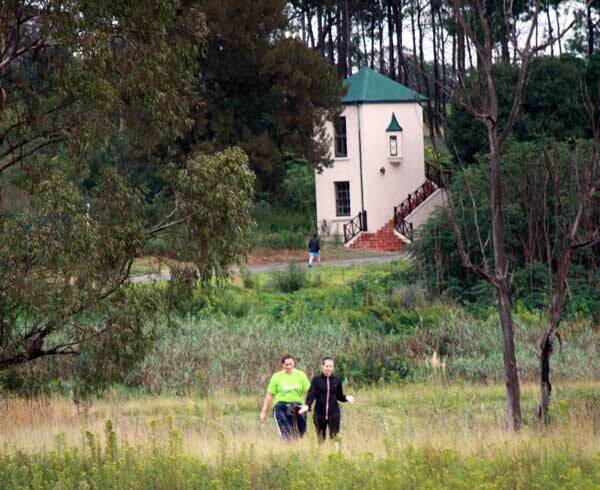 The barn forms the focus for the finish of Modderfontein Reserve parkrun, close to the western fringe of the Blue Crane Dam. An attraction of the Reserve has always been the wide variety of birds that can be found. The number of recorded species currently stands at 253. Birds such as the Fish Eagle and Crimson Breasted Shrike are regularly seen in the Reserve, with seasonal visits by the Long Crested Eagle and other interesting birds of prey. A pair of blue cranes have bred here for the last 15 years. The Reserve has always had small populations of Black-Backed Jackal, Steenbok, Duiker and Genet. The game variety has been boosted with the introduction of Zebra, Black Wildebeest, Red Hartebeest, Blesbok, Reedbuck, and Highveld Springbok. At present, these animals are restricted to an area in the north-west portion of the Reserve. Eager naturalists walking through the area may also have the privilege of seeing some of the Leguaan that are resident along the Modderfontein Spruit, as well as the Cape Clawless Otter, various Mongooses/Meerkats and Hedgehogs. This is just some of what we have to offer at Modderfontein parkrun! We look forward to welcoming eager nature-watching visitors from other parkruns. Roodepoort parkrunners were treated to cake, muffins, champagne and fruit juice at our first birthday celebrations on Saturday. Despite the Cradle of Human Kind half marathon taking place on the same day and the RAC 60km Comrades training run the next day, we still welcomed 77 finishers. The field has certainly grown since our inaugral event on 28 April last year, attended by an intimate group of 12 runners! One of the major sponsors of parkrun South Africa, adidas, joined in the birthday festivities along with their ‘adivan’ to showcase a range of fantastic and highly recommended running shoes. Thank you to Dunmar Security for their contribution at Roodepoort parkun. Over the past few months their presence on Saturday mornings makes everyone feel at ease parking their cars at the start of the run. Marlene Boessenkool was drawn as the winner of the Randburg Runner shoe draw this month! Congratulations and enjoy your prize! The community of parkrunners have come to the party in more ways that one this week, by responding to our appeal for old running shoes. We have collected three large shopping bags of shoes which will be donated to development runners in Soweto. Thank you to everyone for your kind contributions! 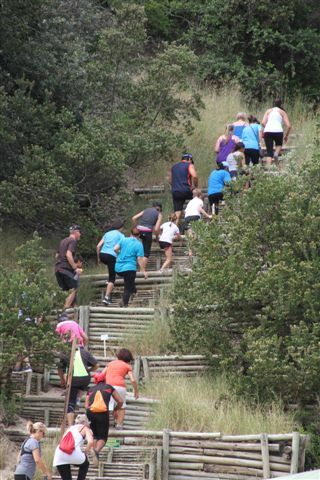 The new "Little Brother" of Nahoon Point parkrun has reached its mid-teens with the sixteenth event being run last Saturday. Sunrise-on-Sea parkrun has grown with leaps and bounds after starting with a record breaking 134 runners on January 5th, 2013. Over the past sixteen weeks we were honored to have two comrades winners running the event, namely Shaun Meikeljohn and Bruce Fordyce. James Matson from the U.K. chose our event to run his 100th parkrun and promptly got married that afternoon at one of our beautiful resorts! Sunrise-on-Sea parkrun has a very dedicated and loyal team of volunteers. Some of whom have not missed an event thus far, come rain or shine. The same goes for the locals from the East Coast. On the 6th of April, one of our volunteers organised a clean up. We cleaned the road and beach that forms part of our route. Well done to Carol, parkrunners and all volunteers. I believe this initiative will take place on a regularly basis in future. I would like to leave you with the following post from our facebook page that puts the spirit of our parkrun in perspective. Tiamari has run all our events to date and had the following to say. I was the "sweeper" at the parkrun yesterday. It was rather liberating to run and have to make sure you are the LAST runner to finish! I was stuck behind a lovely older couple, who were lovingly holding hands all the way. So I stopped at every marshal for a chat and then ran furiously to catch up with couple once again. It took me a full hour and five minutes to complete the 5km. We were sopping wet by that time of course as it was raining cats and dogs. I was more tired than the mature couple because of my last desperate sprint to the finishing line to catch up with them after an exceptionally long chat at the water hole. What a marvelous way to start your Saturday morning! Having achieved any of these milestones, you will become a club member and with the generous sponsorship from adidas you will be awarded a club T-shirt. When you have achieved one of the milestones set out above you will receive an e-mail. If you don’t receive the email please check your spam / junk mail folder. Having clicked on your link and made your request your name, event and size will then be made available to the T-shirt distributor. The T-shirts are then ordered, and then once a month they are sent to the various event directors. The directors will then present the T-shirts at your local parkrun.